Yes, Rimac’s new electric hypercar has beaten the Tesla Roadster’s 0-62 mph time. Back in 2016, Rimac unveiled the production version of the Concept One as the world’s first fully electric hypercar with 1,073-hp on tap. Back then, the Croatian start-up company was relatively obscure in the public eye but was better known in the auto industry developing technology for leading supercar manufacturers. This, of course, changed when Richard Hammond nearly killed himself after crashing the Concept One while filming for The Grand Tour last year. Consequently, expectations were high when Rimac announced it was bringing a new game-changing electric hypercar to this year’s Geneva Motor Show. Called the C_Two, Rimac’s second electric hyper is significantly more powerful than its predecessor. As we learned yesterday, it’s nearly twice as powerful as the Concept One, with a combined output of 1,914 hp and 1,696 lb ft of torque. Rimac really wasn’t joking when it said its second electric hypercar will be “in a league with Pagani, Koenigsegg and Bugatti.” As a result of this phenomenal power, the C_Two is capable of hitting 0-62 mph in a mind-blowing 1.85 seconds, making it faster off the line than the Tesla Roadster. If you need a recap, the Roadster does the same sprint in 1.9 seconds. By contrast, the Concept One needs 2.5 seconds to do the 0-62 mph sprint. In the C_Two, 0-100 mph takes just 4.3 seconds before the electric hypercar tops out at 258 mph. Like the Concept One, the C_Two has an electric motor at each wheel allowing for four-wheel drive. A pair of independent single-speed gearboxes drive the front wheels, while a pair of two-speed carbon-clutched gearboxes power the rear wheels. The four motors all work together via torque vectoring, combined with beefy, 390 mm carbon-ceramic brake discs and six-piston calipers on both front and rear axles. Despite a completely carbon fiber chassis and copious amounts of carbon panels, the C_Two is a hefty 4,299-pound machine. 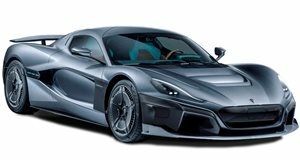 However, Rimac makes up for this with its aforementioned torque-vectoring, which is fully adaptive between all four wheels. Powering the motors is a huge 120kWh battery pack featuring a liquid-cooled thermal management system to keep temperatures down during fast-driving conditions. Rimac claims this provides a total range of 404 miles on an NEDC cycle and can be charged to 80-percent capacity in less than 30 minutes. In addition, Rimac says the C_Two features Level 4 autonomous driving technology. This is made possible thanks to the use of eight cameras, a lidar, six radars, 12 ultrasonic sensors, and an “exceptionally precise” GPS. It also has artificial intelligence is also present, as the car uses facial recognition cameras to unlock and start without a key. Production of the C_Two will start later this year, with production limited to just 150 examples.